Yesterday I woke up feeling grumpy, raw, vulnerable, scared, constricted…so I got on my friends awesome baby blue cruiser bike and went for a long ride north along the coast. I noticed my brain wouldn’t shut off, swirling about in stories, frenetic. I tried to control it, to steer it but it needed to come out. So, I stopped at bench, called a friend and let it out…it ending up being around control, trust, being vulnerable with a friend, hiding how I was feeling. So many different luscious human things. 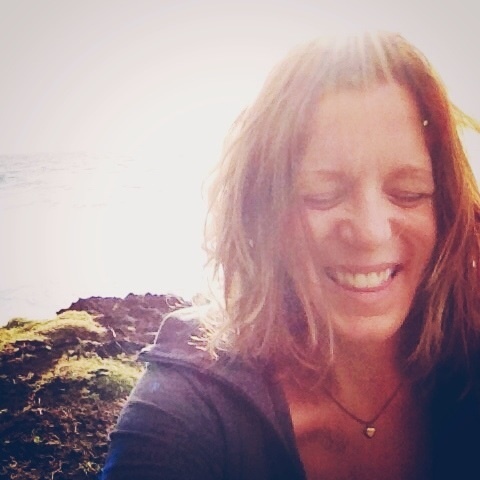 It was so good to get it out, to move that energy through, for my wild heart to be expressed, witnessed, to feel my body sink into the bench, to see what was in front of me: ocean, beach, birds, blue sky…I started feeling calm, grounded, connected and present. I love coming back to my body. I’ve been doing a week of restorative yoga to move old energy, old pain through my system, to come back to center. And in every class I’m reminded of what my body’s been holding on to. What I didn’t know how to move through for so long. Rage, grief, tears, injustice, desire, joy, heartache, wanting to be seen and loved. In slowing down and being gentle with my body, these old emotions are emerging. And I'm reminded of what's on the other side of these old emotions: connection, vitality, power, softness. My skin is glowing, my body is getting lighter, releasing weight and pain it doesn’t need to carry anymore. Any moment you can, get in your body. Whether its a tip-toe stretch, slow hip circles, a caress, a slow neck stretch, a nap on the beach feeling the ground underneath you...this is THE move. Getting back to our bodies, to move out the old and then get back to our essences where we remember all is well, where we feel our power. It is here, in this space we relax, we can feel and see other possibilities. Moving our body gets our brain behaving differently, gets our hormone responses balanced out…it’s just great medicine. Think of your getting back to your body as great medicine. So stretch, hang, bend, sway and give your body permission to let go, to relax and see what emerges, it’s helping you clear out your heart and body so you can return to your wild. Oh and during that break on the bench talking with my friend? Not only were there various kinds of hundreds of birds on the ocean reminding me to be wild, free, to fly and dive and soar and sit on the water and go with the flow…dolphins pop out of the water. Dolphins!!! Magic and miracles. I admit it, I squealed…me in my wild. How can you be in your body more and more, in gentle ways, in ways that call to you and resonate and don’t feel like a should but a beautiful gift you are giving yourself? View from the bench, don't think I got the dolphin near the shore. Wild living. Perhaps today is when you need it more? Enjoy!